Cheers to The Drunken Chicken! The Chicken & Waffles joint is celebrating one year of business on the Avenue. To celebrate, they are throwing an epic one year anniversary celebration all weekend long. This is a party you’re not going to want to miss. The Drunken Chicken has quickly become a Fourth Avenue staple and has an almost cult-like following of fans in the community. And it’s easy to see why if you take a look at their innovative menu. Beyond delicious fried-to-order chicken and tasty waffles, the Drunken Chicken is known for innovative sides and sandwiches (the Mac & Cheese is a fan favorite). To cater to those looking for a healthy option, the Drunken Chicken even serves salads. Drunken Chicken owners Ben Sattler and Michah Blatt are no strangers to owning businesses on the Avenue. The duo had partnered before and are co-owner Mr. Heads Art Gallery & Bar. 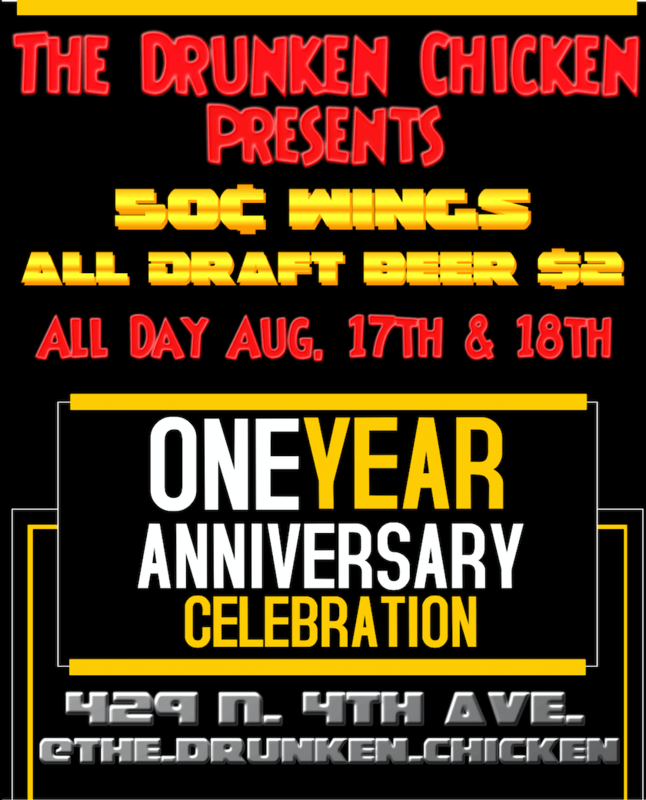 To celebrate their one year anniversary, The Drunken Chicken is hosting an epic weekend of specials. Attention Chicken Wings fans: on August 17 & August 18, you can enjoy wings all day long for only $0.50! And to help wash down all that tasty chicken, enjoy all draft beers for only $2. Sounds like an epic deal to us! For more information about The Drunken Chicken or their anniversary party, visit: https://www.thedrunkenchickenaz.com/.